Quiet, Please: Unleashing 'The Power Of Introverts' Introvert Susan Cain is here to make the case for people who like to work in peace and quiet. Today's workplaces are designed for extroverts, she says, and put too much emphasis on group work. Cain's new book is called Quiet: the Power of Introverts in a World that Can't Stop Talking. From Gandhi to Joe DiMaggio to Mother Teresa to Bill Gates, introverts have done a lot of good work in the world. But being quiet, introverted or shy was sometimes looked at as a problem to overcome. In the 1940s and '50s the message to most Americans was: Don't be shy. And in today's era of reality television, Twitter and widespread self-promotion, it seems that cultural mandate is in overdrive. Susan Cain — who considers herself an introvert — has written a new book that tells the story of how introversion fell out of style. 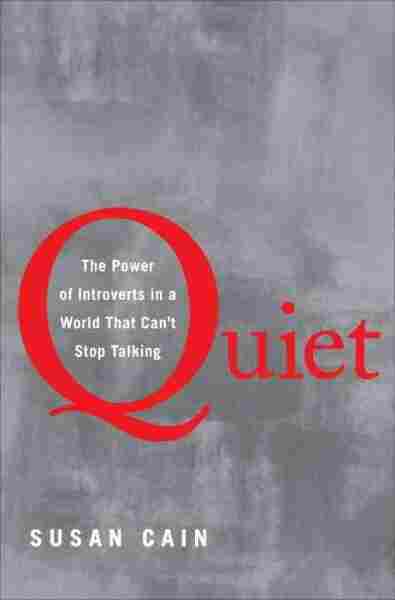 She talks with NPR's Audie Cornish about Quiet: the Power of Introverts in a World that Can't Stop Talking. "Many people believe that introversion is about being antisocial, and that's really a misperception. Because actually it's just that introverts are differently social. So they would prefer to have a glass of wine with a close friend as opposed to going to a loud party full of strangers. "Now, shyness, on the other hand, is about a fear of negative social judgment. So you can be introverted without having that particular fear at all, and you can be shy but also be an extrovert." "We moved from what cultural historians call a culture of character to a culture of personality. During the culture of character, what was important was the good deeds that you performed when nobody was looking. Abraham Lincoln is the embodiment of the culture of character, and people celebrated him back then for being a man who did not offend by superiority. But at the turn of the century, when we moved into this culture of personality, suddenly what was admired was to be magnetic and charismatic. "At the same time, we suddenly had the rise of movies and movie stars. Movie stars, of course, were the embodiment of what it meant to be a charismatic figure. So, part of people's fascination with these movie stars was for what they could learn from them and bring with them to their own jobs." Before becoming a writer, Susan Cain practiced corporate law for seven years and then worked as a negotiations consultant. "None of this is to say that it would be a good thing to get rid of teamwork and get rid of group work altogether. It's more just to say that we're at a point in our culture, and in our workplace culture, where we've gotten too lopsided. We tend to believe that all creativity and all productivity comes from the group, when in fact, there really is a benefit to solitude and to being able to go off and focus and put your head down." "My criticism in the book is not of extroverts at all, but rather of the extrovert ideal. I actually find extroversion to be a really appealing personality style. ... Many of my best friends truly are extroverts, including my beloved husband." 6. ______ People tell me that I'm a good listener. 7. ______ I'm not a big risk-taker. 11. ______ I prefer not to show or discuss my work with others until it's ﬁnished. 15.______ I feel drained after being out and about, even if I've enjoyed myself. 17. ______If you had to choose, I'd prefer a weekend with absolutely nothing to do to one with too many things scheduled. 18. ______ I don't enjoy multitasking. From Quiet by Susan Cain. Copyright 2012 by Susan Cain. Excerpted by permission of The Crown Publishing Group, a division of Random House Inc.